FUTURES | Asif Kapadia, Director of Racecar Doc “Senna”: Off With the Talking Heads! FUTURES | Asif Kapadia, Director of Racecar Doc "Senna": Off With the Talking Heads! Hometown: Hackney, Greater London, U.K.
Why He’s On Our Radar: Asif Kapadia is no newcomer. The filmmaker won a BAFTA for his 2001 visually ravishing epic “The Warrior” and helmed the Sarah Michelle Gellar horror flick “The Return.” So why are we profiling him? 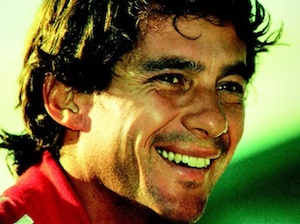 His Sundance award-winning sports documentary, “Senna,” marks his first stab at documentary filmmaking, and he nails it. Compiled entirely of past footage and without a single talking head, “Senna” tells the story of how Brazilian motor-racing champion Ayrton Senna became a icon in his homeland and a legend around the world. The film’s already become the highest-grossing documentary in U.K. history, earning over $5 million since hitting theaters in early June. It hits select U.S. theaters this Friday, August 12. More About Him: Kapadia, a British filmmaker of Indian descent, studied filmmaking at the Royal College of Art where he gained attention for his short “The Sheep Thief” (1997). The film went on to win second prize at the 1998 Cannes International Film Festival Cinefoundation. His first feature “The Warrior” (2001), garnered three BAFTA awards nominations and winning one for British Film of the Year. He followed that up with “The Return” (2006) and “Far North” (2007), which premiered at the Venice Film Festival. “Senna” marks his fourth feature. How did you prove to the producers that you were the guy for the job, given your credentials? You know it’s interesting, because it was almost the opposite way round. The producers had the idea to make the film. They approached Working Title Films; they approached the family to get the permission to make the film; they approached the man who owns the commercial rights to Formula One (he owns the footage). They then met obvious directors who had made documentaries. For one reason or another it didn’t work. Eventually the producers approached me. They had seen “The Warrior,” which is quite unusual when you compare it to “Senna.” They wanted a filmmaker who could make Senna’s story cinematic. I didn’t necessarily have to pitch for the film. Because I’m a big sports fan, I was able to talk about sports and I remembered him. I knew that world, and was interested to tell that story. I was also enough of an outsider to ask questions for the non-fans. We had to make it work for people who had never heard of him. That balance was something that the producers responded to. Given that the producers believed in you, what gave you the confidence as a first time documentary filmmaker to tackle such popular subject matter? I was into sports long before cinema. My first love was soccer. I always wanted to make a movie about a sports subject. I had always gone at it the classical way, setting them up as dramas, and it just didn’t work. The most amazing thing in real life doesn’t work on paper. There was this massive responsibility in bringing this to the screen. I knew if I could make it work, it would get seen by lots of people. Also, whenever one makes a film, I’m always reacting to what I did previously. Coming from a really tough location shoot in the Arctic on “Far North” – the look of the film, like most of my films, is a big part of it — the idea of making a film where I had no control over the look, was an interesting challenge. It was an opportunity for me to work on my weaknesses. All I could worry about was the story and the character, in a way the most important thing. Asif Kapadia’s “Senna.” Producers Distribution Agency. The more time I spent looking at the material and researching, the more I thought we could do something really interesting because there was so much material. I was the luckiest guy to have the opportunity to work with these dailies. It was all there. The beginning, middle and end. Our biggest problem from day one was how we were going to cut it down to length. When the producers first approached me, they set it up as a much more conventional way: 40 minutes of archives, 40 minutes of talking heads and ten minutes of miscellaneous. I agreed to do the film in a more conventional sense. Then when I started to cut the film, I’d refuse to cut the old footage. I didn’t want to use talking heads. I didn’t need them. So that was the big creative idea that I brought to the film. We won’t have a voiceover, we won’t have a narrator, we won’t have any stills, any CGI. We’re only going to use what we can show. That technique (no talking heads, just archived footage), factors greatly into why the film works so well. What did the subjects you interviewed think of the final film when they saw only snippets from their voice recordings included? That’s funny, I don’t think that question’s ever even come up! I think anyone who was interviewed is always shocked by how little makes the final film. What we have to realize is that the people I interviewed had been interviewed thousands of times. They know better than anyone how the media works. To be honest, they all look younger, they all look better looking, so I don’t think anyone’s complaining. What we will do – the DVD and Blu-ray versions will have a lot more footage and material. On that version of the film, we’re able to show the contemporary interviews. Do you see yourself tackling more documentaries in the future now that you made “Senna”? I really enjoyed the process. After having made both narrative films and documentaries, I can tell you it’s really hard work to make a doc. It’s not any easier. Whatever the initial idea is, it will have the right medium. Some have to be documentary, some dramas and some of them in the middle. I would love to try and balance the two for sure. When I’ve made dramas before, I’ve always wanted them to have a element of naturalism and truth that feels almost documentary-like. In the documentary, you’re using all the classic techniques of drama. Have you grown tired of the talking-head technique? My instincts are not to use them. When I was younger, I worked in television. And that’s all I did, shoot talking heads. In a way I felt like I was always shooting a scalp. I didn’t have a way to do cinematic storytelling. The filmmakers that inspired me were people who tell stories visually and make films for the cinema. For me, the talking head model is just a bit more TV. But that’s just my taste. It doesn’t mean I won’t do it one day. But in terms of movies, I always try to make a film as cinematic as possible.